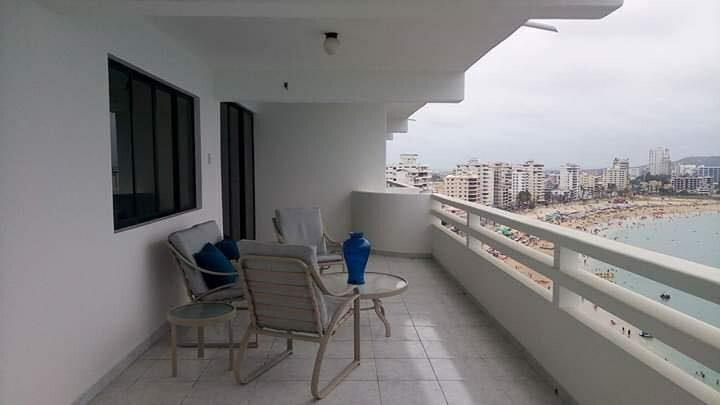 Enjoy the security and privacy of living in a gated community all of 10 minutes from the beach and boardwalk of Salinas. This small gated community of about 50 houses has a nice social area consisting of pools, Jacuzzi, and tennis court. The rental is a nice sized, two-story house with parking out front for 2 vehicles. The first floor is open concept living, dining, and kitchen areas with laundry area and visitor’s bath. Upstairs there are three nice sized bedrooms and two full bathrooms. The bedrooms and the living room all have window treatments and air conditioning. There is an exterior patio out in the back. Small dogs allowed with prior approval and deposit. Annual contracts only are $900/month plus all utilities. You will most definitely be spending all your time out on this fantastic balcony!! 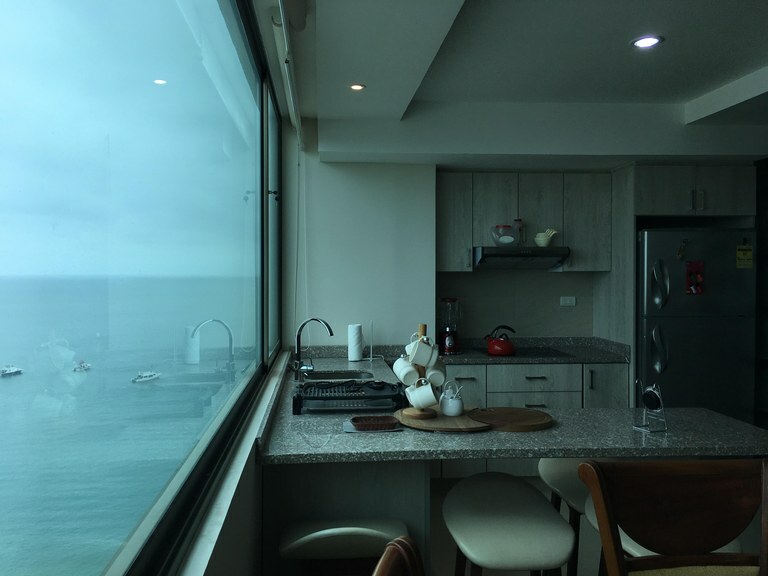 Enjoy great ocean views from this high floor condo while feeling those great sea breezes. This condo has three bedrooms and three full bathrooms and is approximately 1300 square feet. There is a nice size living/dining area which opens up onto the balcony. There is a large kitchen off which is the laundry area with service quarters including bathroom. The master bedroom has air conditioning. High season monthly rate is $2000; Low season monthly rate is $1500; Year contract rate is $1100. Holiday week $2500. All rates include homeowners fees. All utilities are separate and tenant can install internet and cable tv if they so choose. Sorry no pets. No three bedroom units in this building are currently being sold at this price point! Take advantage of this fantastic opportunity in one of Salinas’ most highly desired buildings showcasing fantastic amenities in a great boardwalk location. The unit is 138 square meters and has three bedrooms, three full bathrooms, a living room, and open concept dining/kitchen. The three bedrooms all have air conditioners and built-in closets. Two of the bedrooms have balcony access. The kitchen is american style with breakfast bar, granite countertops, upper and lower cabinets for nice storage space, and a small laundry room off to the side. The unit has an interior garage parking spot as well as storage unit. Being sold furnished with exception of tv’s, artwork, and personal items. The 2018 homeowners fees are $125 and the 2018 property taxes were approximately $350. Olon land for sale at only $25/m2 !!! This is a great development parcel for someone looking to design a gated community and build homes for re-sale. Located in the mountain areas of Olon, only a short distance from the ocean. 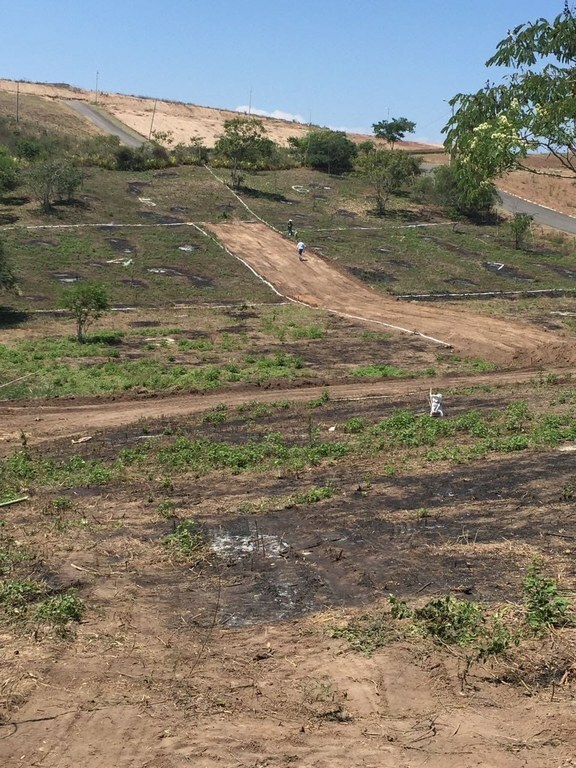 The macrolot is ready for sub-dividing into 8 smaller lots of approximately 800 square meters each. There is already access road to the macrolot. Water, electric, internet are all easy to obtain. Great investment opportunity for anyone with building experience. 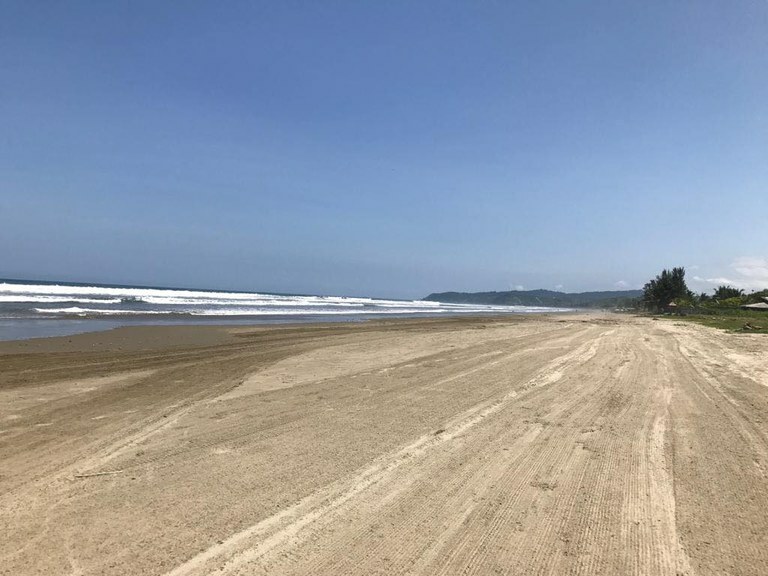 Live and work in one of the hidden gem beach towns of Ecuador, Ayampe. 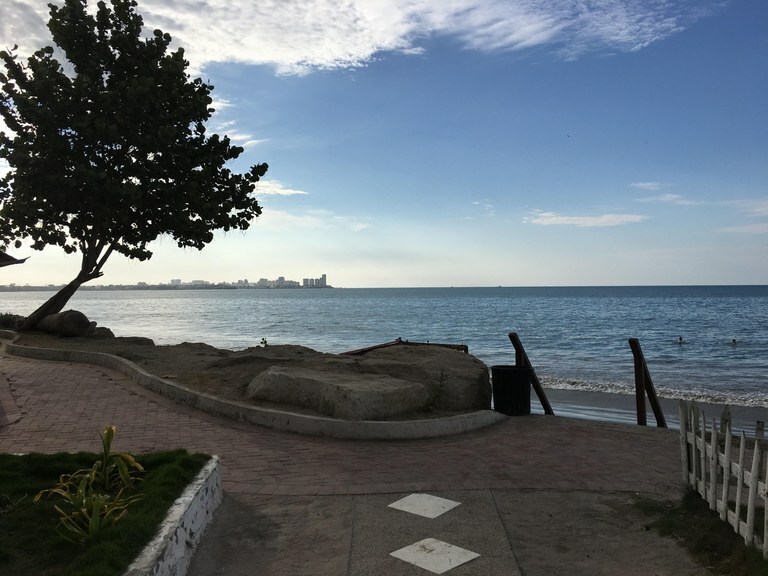 This town is highly sought after by many Ecuadorians as it is seen as the most up-and-coming area on the middle southern coast. 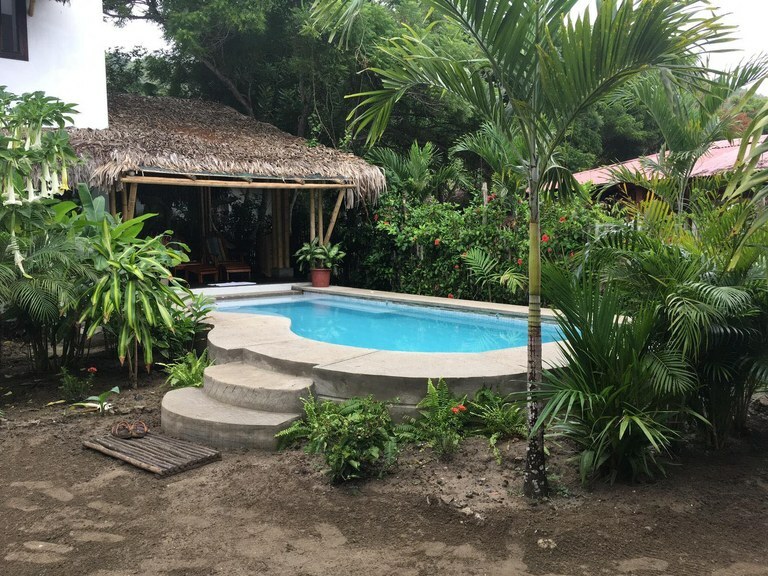 You will enjoy living in the lush tropical feel of this lazy surfer town with the beach only a short walk from your home. The front part of the property is a commercial location currently occupied by a very successful eatery and souvenir shop. To access the house which is in the back half of the property you walk through lush vegetation. There are two small separate “casitas”, one acting as a pump room and the other housing the generator. The home itself is two bedrooms, 2 bathrooms and open concept living, dining and kitchen. A wonderful combination of natural elements abounds throughout this home, especially the stone accents and woodworking which is just beautiful. This modern contemporary home was custom designed and crafted with mixed use of wood and stone. 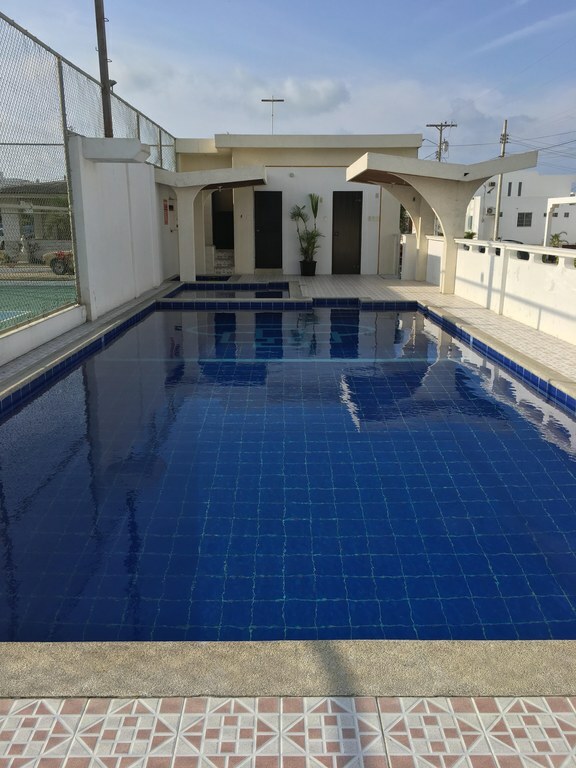 Located in the up-coming town of Tumbaco, in the suburbs of Quito and close to the new airport, this area is great for families and retirees alike. The home has many personalized touches and great finishings. There are 5 bedrooms (one of which is currently being used as an office) and 4 full bathrooms. Living, dining and open kitchen. 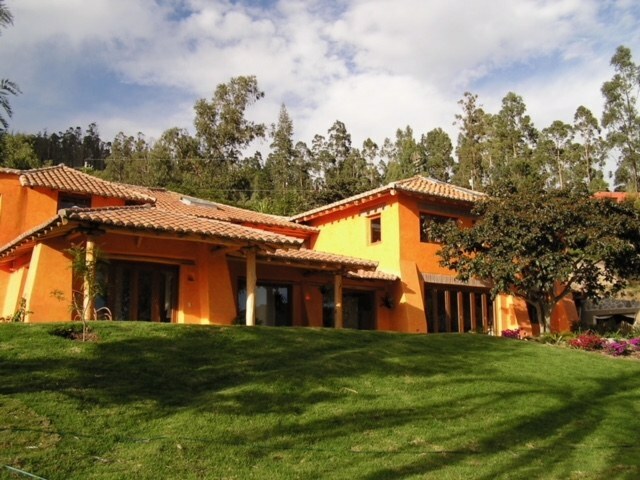 Tumbaco is on the outskirts of Quito in one of the highly developing areas for those looking to move outside the city and yet still have easy access. Got imagination? Got skills? Got milk? All kidding aside, this Chipipe property is a great business opportunity for an investor who has the vision to see the huge potential this property really has. 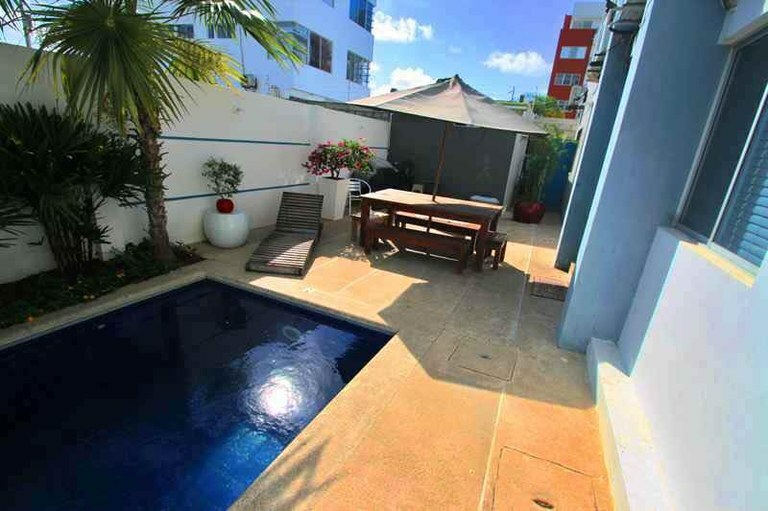 A corner lot of 750 square meters, this home is in a fantastic neighborhood all of 4 short blocks to the beach. 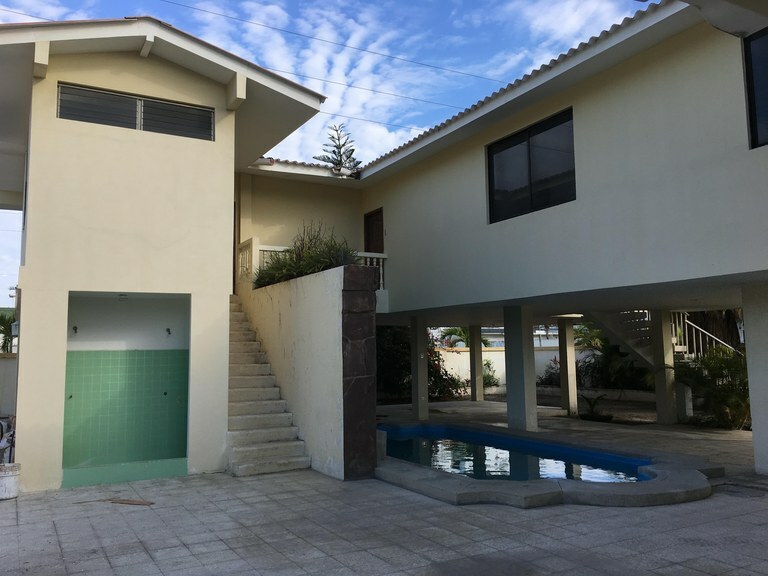 The house is a traditional Salinas beach house in that it is all on the second level; underneath the home is an open patio area which could easily be converted into a business (think enclosed with all-glass) or finished out to be a complete new apartment. The upstairs has about 2000 square feet of living space with 5 bedrooms, 4.5 baths, separate kitchen, and open concept living/dining areas which open out onto a nice sized balcony. The patio area of the property has a large storage area, a guard’s quarters, a nice sized in-ground pool and a driveway which can easily fit 5 cars. Mature beach landscaping surround the perimeter walls. Think outside the box and recall those “This Old House” episodes to exploit this property into what could be Chipipe’s next up-and-coming venue. This is a cozy rental unit located in a nice area of Salinas, walkable to the Yacht Club and Paseo Shopping Mall. Across the street is a nice swimmable beach area where local families come to enjoy on weekends or holidays. The condo is approximately 800 square feet, and has central air throughout. There are 2 bedrooms and 2 full bathrooms. An open concept living/dining area and a small galley kitchen. The unit is furnished with the basics except the kitchen (tenant would need to provide appliances). The building has an elevator, security guards, a pool and a jacuzzy. Long term contract (year) rental rate is $600/month plus all expenses and hoa fees. Tenant can install own internet and/or cable tv channels if so desired.